So, I was just checking out two new Lenormand decks from U.S Games…. 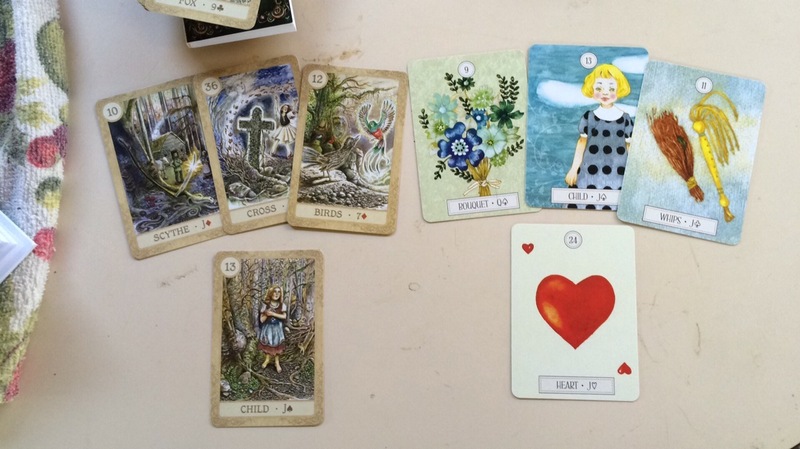 The gorgeous Fairy Tale Lenormand by the amazing Lisa Hunt….and pulled four cards; 10- Scythe; 36- Cross; 12- Birds and 13-Child… Accident, death, gossip and a child. From the equally beautiful Dreaming WayLenormand by Kwon Shina 9- Bouquet; 13-Child; 11- Whips and 24- Heart…a beautiful child, argument, love. Not even five minutes later I get a breaking news blurb about the still unsolved Jon-Benèt Ramsey murder. Seems that investigators think the brother Burke accidentally killed her in a fit of rage (as it was known about his volatile temperament) and the parents covered it up to protect the child that they had left.